Posted on August 30, 2011 by Albert G.
Even though I am SO over the heat, humidity and weather identity crisis (and ultra-ready for Fall and beyond)–there is something about a great flower that always reminds you of the good things that come from Summer. 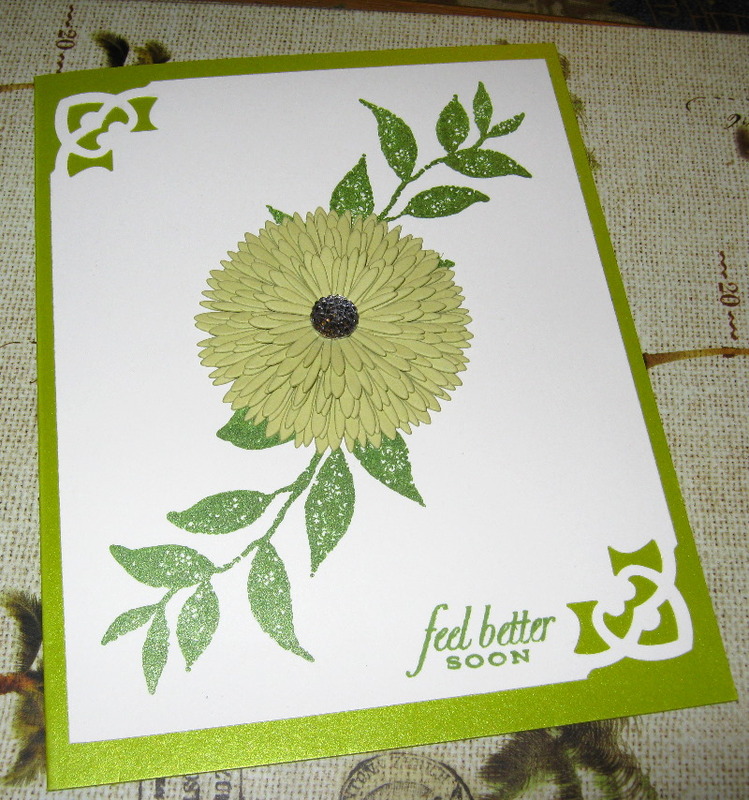 The front of this card has a great flower (if I may be so bold as to say to). 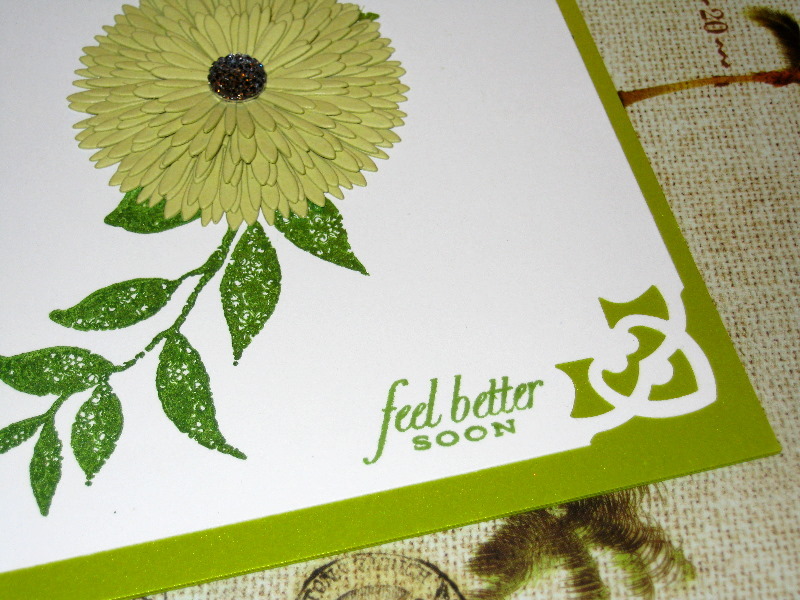 The flower on this “get well” themed card was created with one Papertrey Ink’s fantastic steel dies. I have many of the dies they have created and this one, “Bloom Builders #3” (released in the August 2011 collection) is one of my very favorites. The die cuts five layers of petals in one pass through a standard die-cutting machine. Three layers will have the centers removed (to avoid the build-up of paper bulk in the center of a flower) and two will have solid centers. I used Papertrey Ink’s cardstock in “Spring Moss” and cut the five layers twice–for a total of ten layers to create the flower. As you layer the same size flower to one another, simply rotate the petals to create the maximum effect of as many petals showing as possible. I used a Zig two-way glue pen to adhere my layers together. 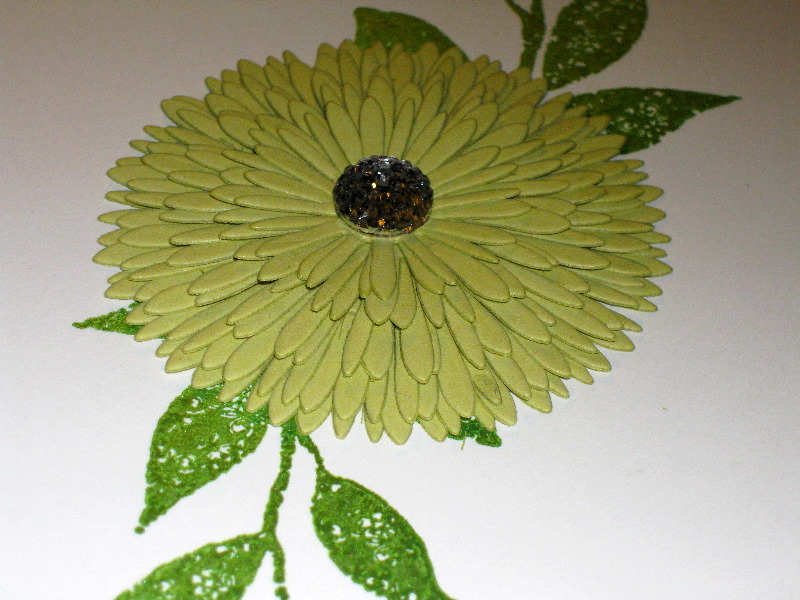 To add a bit of pop to the flower (and card), I used a Kaiser Craft Sparklets stone (love these!). For the card base, I used some mica cardstock in an A2 size. The mat is a 4″ x 5″ piece of Papertrey Ink Stamper’s Select White cardstock. 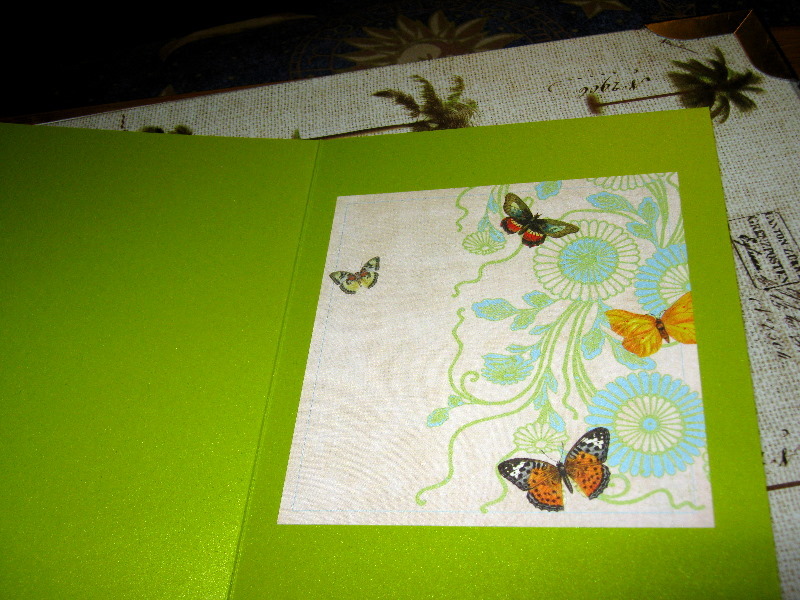 I used the Martha Stewart French Scoll corner punch on two corners of the mat. The vine image was stamped twice in reverse directions. 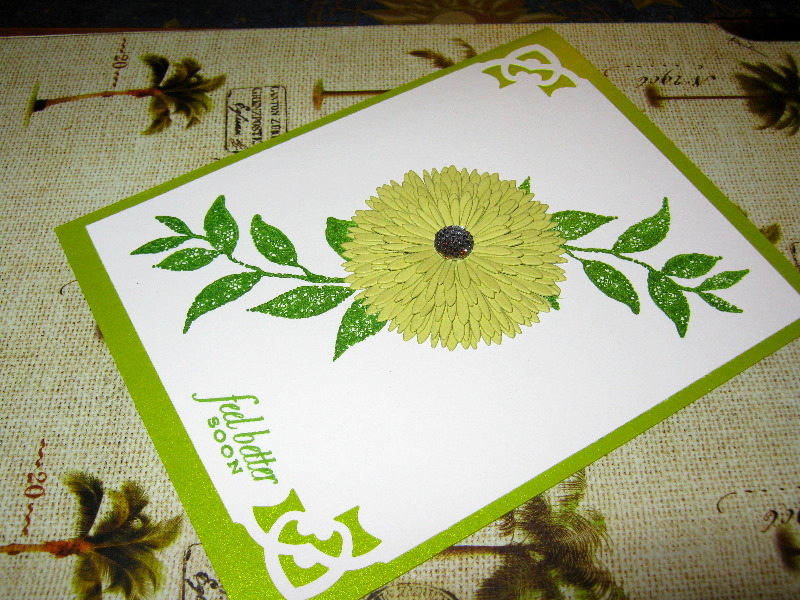 It is from a Kaiser Craft clear acrylic stamp set called “Blae & Ivy”. 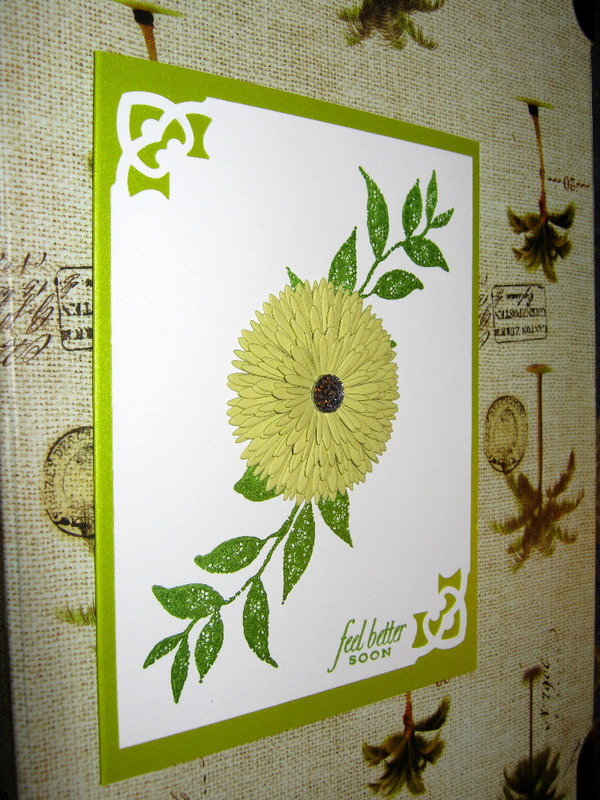 I stamped the image using Tsukineko Brilliance pigment ink in Pearlescent Thyme. The paper for the inside journaling block is from Webster’s Pages. This entry was posted in 2-way glue pen, acrylic block, adhesive, atg714, bling, cardmaking, cardstock, carl rt-200, clear acrylic stamps, cuttlebug, decorative paper, die-cuts, flowers, inks, kaiser craft, Martha Stewart, mica cardstock, paper piecing, papertrey ink, punches, scor-buddy, stamping, stardream so silk!, steel dies, tsukineko, webster's pages, zig by Albert G.. Bookmark the permalink. I LOVE this card! I have that die ~ Great minds think alike! Your cards are alwayss so pretty, especially the way you dress up the inside. Thanks for sharing, Albert. I hope it cools off soon. It has here in Kansas!